LONG AGO, I RAN ACROSS woodworker Peter Kramer. Peter’s work caused a significant change in my method for designing woodworking projects. His furniture designs often had what I call a visual hook; a design feature which was out of the ordinary; even out-of-place. His design style caused me to look for ways to include a visual twist to my designs. I wrote a blog post about Peter in February of 2010. 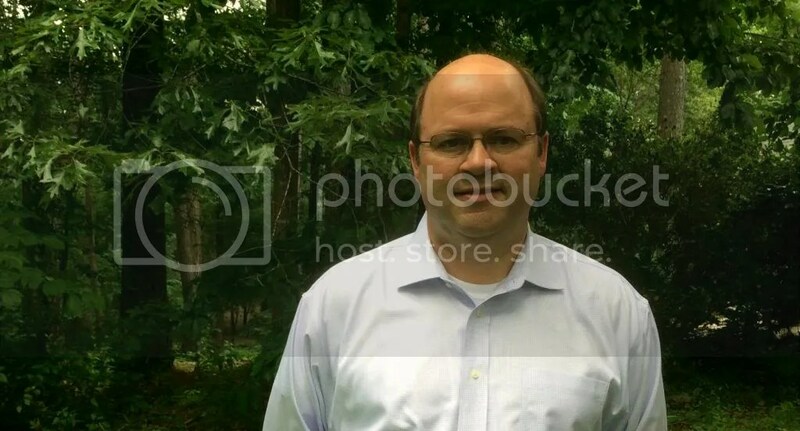 Take a look at it here (the link will take you to my old blog – the photos are clickable for a larger view). Scroll down to the second photo; a tall chest of drawers. Note how the bottom drawer is separated from the rest of the drawers by the unusual placement of a molding detail. Further separating this drawer: the upper drawers feature scratch carving; the bottom drawer is scratchless. Really, the bottom drawer, which is supported by short legs, almost looks like an after thought. Be sure to look at the other photos as well; they show more of Peter’s well designed furniture. Needed changes in the tool cabinet design. I like this design, but there is a big problem: my jointer plane will not fit in either of the lower drawers. The plane is longer than the drawers are wide. I have a fixed amount of space available for the tool cabinet. One way to gain more space is to eliminate the double face frame you see in the design. Also, I began to wonder if playing around with the drawer arrangement would add the visual hook I am looking for. I actually came up with a design which featured an asymmetrical drawer arrangement for the smaller middle drawers. But it looked sort of weird – so much so that I am not even going to show it to you. I don’t want to diminish the effect of the three stair-stepped drawers at the top of the cabinet. They are distinctive. At this point I am thinking about eliminating the double face frame, making the drawers a little bigger and maybe play around with wood color. For some color inspiration, I turned to work by furniture maker Ron Layport. Ron Layport using wood color to create visual interest. 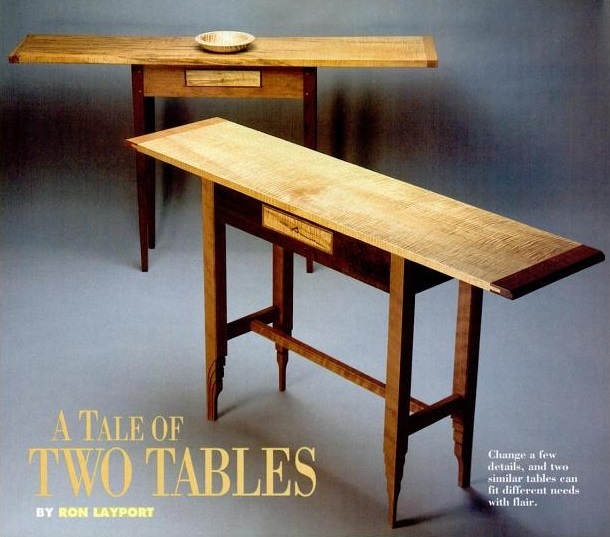 The image above is from American Woodworker, issue 36, January/February 1994 (see the magazine in Google Books by clicking here; look for “A Tale of Two Tables”. Ron has a lot of experience mixing woods of different natural color further enhancing his already awesome furniture designs. Back in the day, Ron started showing up in magazines like American Woodworker and Fine Woodworking. 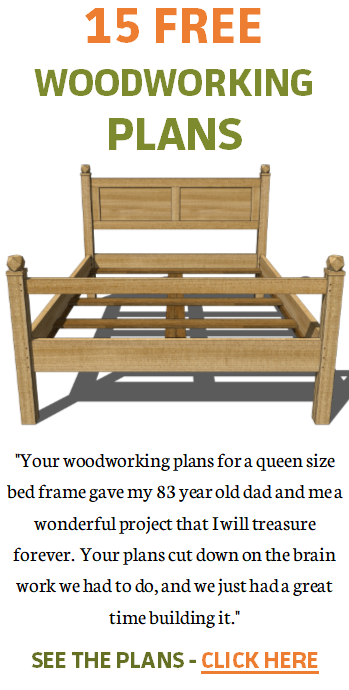 I know of two of his designs which became project articles in Fine Woodworking (today, Ron is a master wood carver). The updated tool cabinet design. A close up shows a small molding detail at the base of the stair-stepped drawers (click to enlarge). 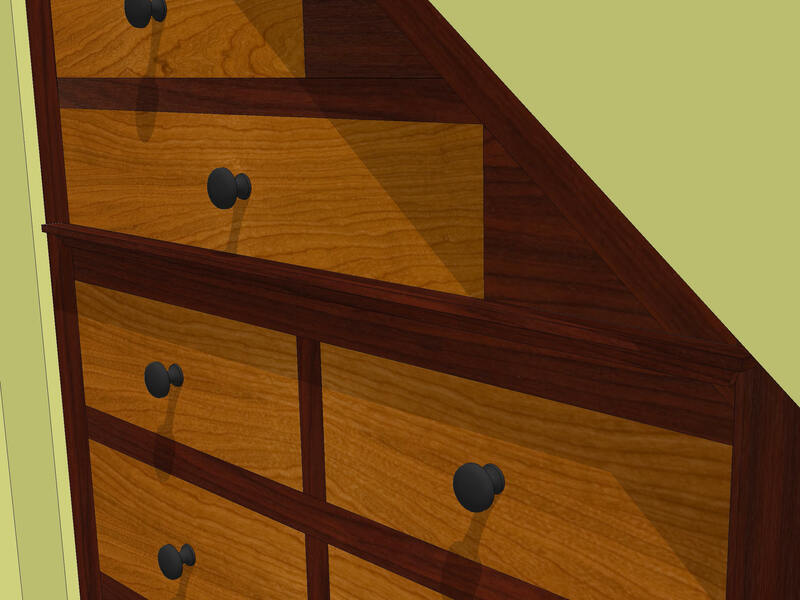 The color is supposed to be walnut for the face frame and cherry for the drawers, although I may use mahogany since cherry can darken considerably over time minimizing the two-tone color effect. 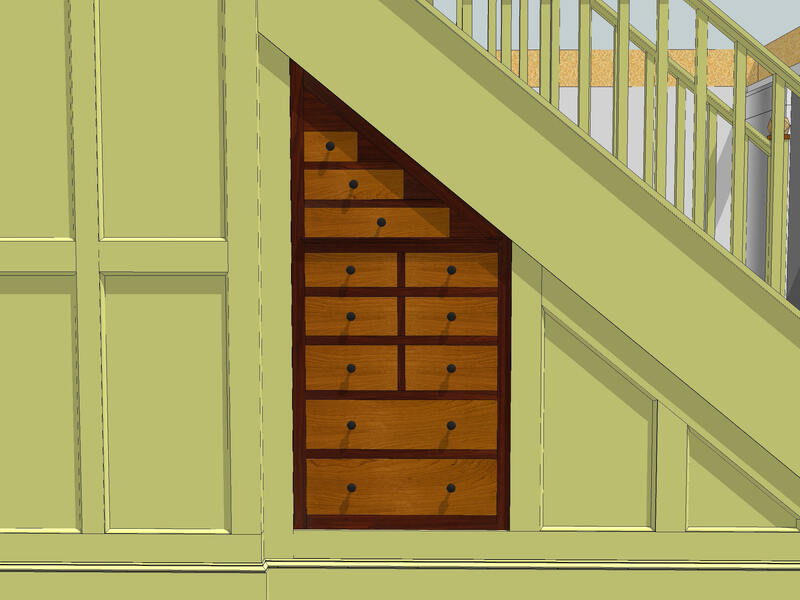 The little molding detail separating the stair-stepped drawers from the main drawer area is hard to see – it is meant to be just a minor way to provide some separation; sort of like Peter Kramer did on the chest of drawers I mentioned above. I may also add a third color by introducing a bead around the drawer openings, but that will make the project considerably more complex and I am trying to keep the design simple. FOR TODAY, I will be attempting to change out our washer and dryer. One event which has kept me away from woodworking has been moving our daughter to a new apartment. Her new apartment comes equipped with a washer and dryer. So, the washer and dryer from my daughter’s previous apartment now reside in our basement. They are relatively new and the washer and dryer my wife and I own are old, so I’ll be swapping them out today. Note in the image below that our washer and dryer hook-ups are in the far corner of our basement. 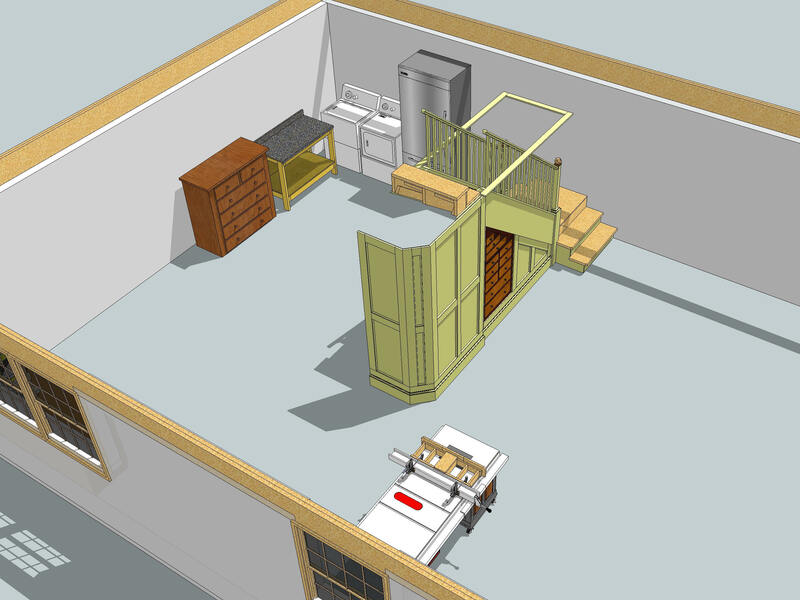 An incomplete SketchUp model of my workshop. This means that I will have to move my table saw and router table; disconnecting both from my dust collection system. I’ll have to move my miter saw stand, workbench and bandsaw among other things. In short, my workshop will be largely dismantled to facilitate moving these appliances through the narrow route to the corner of our basement (what you don’t see in the SketchUp image is all my carpet samples and various household items which are stored in the basement). I’m not looking forward to this, really. But it has to be done and all of this tool moving will force me to get my shop orgainized prior to this next woodworking project; so it’s good to do. I plan to begin work on the new tool cabinet very soon. 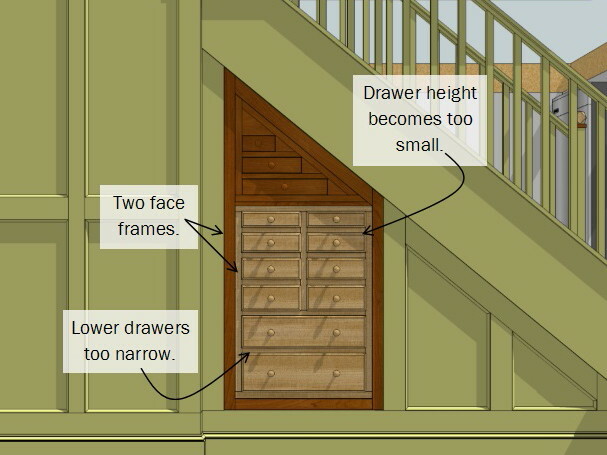 Just a thought but maybe with the top three drawers instead of the drawer being square on the right side make the face plate follow the stair line. Love your work Jeff! I’ll give that some thought because it is a good idea. Thanks for stopping by! Maple is a good contrast wood for cherry or walnut. Hey Dennis. Tiger maple is one of my favorite woods. If I add another color, it will be maple. The final design is excellent but how does one see what is in the top drawers? Would one have to remove the drawer to access the contents? Hey Mark, the top drawer is about eye level. I plan for the top three drawers to hold nails and screws and be easy to pull out when need be. I’ll have a more detailed SketchUp model soon.